Tony Segale Fine Art & Gold Leaf | Eliminating the boundaries between fine art and commercial design by adding colors and/or metals to the way I perceive the image should be. Eliminating the boundaries between fine art and commercial design by adding colors and/or metals to the way I perceive the image should be. Saturday Art Studies will get underway for 2016 on Saturday, April 23, and continue once a month through October. What happens from 9am until 1pm on these continuing art study sessions is different each month, yet they build on our skill development. As an example, last year we began with a drawing and sketch session and then moved into watercolor basics and watercolor painting. Every student has four weeks to go back to their own studio area and practice, learn and practice again and again. Every artist is self taught, so with that in mind, I can only guide your development by your observance on my practice and development. That is the concept in the briefest of words. During one of the Saturday Art Study sessions last year, I took a sketch from a October 2015 visit to Disneyland as a study for designing and developing a painting. I’m not trying to create a masterpiece, I’m going on a journey of discovering the “what ifs” when I paint. “What if” I rework the scene without obvious items in the scene, to simplify the idea and feel of the moment. We were sitting on a bench prior to a fireworks display over the castle. The weather was unseasonably warm, topping 100 degrees each of the three days we were there. Yet, a coolness began to try to sneak in, or were we longing for it more than was obvious? The first “what if” happened as I began to sketch. I realized I was wearing my spectacles for better distant vision, this was a blurry quandry when I glanced down to my sketch book… so, “what if” I can’t see the pen lines so clear, keep sketching. The brain has a keen sense of memory when sketching, better than any photograph can give… its a hand eye thing I believe. Here you see the original sketch with a fine sharpie marker, notes added in the margin for memory and locating special interests. If you notice, there is a grid that I added after completing the value plan. Next I draw a gird on the larger watercolor paper and transfer the drawing respectively to each rectangle. With the lines transferred to the paper and the value plan in hand, now I only have to think about color. All of my “what ifs” have been questioned… except, “what if” I were to choose predominately a blue and violet color scheme? And add a bit of orange for the warm summer evening? So, after wetting the paper thoroughly, I banged in the colors, wet into wet. I left this painting as is for several weeks , so each student can view the process at the next Saturday Art Study. At the next Saturday Art Study session, we reviewed the process, and we reviewed what each artist discovered with their own paintings, and then I proceeded to add a bit of gradated color to the castle, line work in the trees a bit more depth in the darks. The hardest part for me is knowing when to stop. “What if” I add more color here, a darker value there? The mood of the evening, waiting for the fireworks show, “what if” I don’t add a single Disneyland logo, would the piece still be recognizable, or invite the viewer to add their imagination while looking at the painting? These questions became decisive in my decision to finish the piece with darker values in the trees and hazy silhouettes in the crowd. When I ask where should I stop, I recall one instructor’s comment – a master knows how to begin. Every creative process begins with a journey, a beginning, an exploration, a discovery, a failure, a success, and a never ending lust for another journey. When the journey arrives at a point of an unforeseen problem, time spent considering a solution can result in a more original and creative answer. Creativity is only possible when there are options, options are freedom. While a creative action is a risk of failure, avoidance of the work and anquish over creating is inhibitive. Create another reality, somewhere the mind can dwell. Another kind of journey is a necessity, an escape away from the realm of thinking. Thinking of what to create, searching for the worthy subject, riding deeper into the wilderness of the unknown and finding an escape from all that is known, all thoughts erased. An open mind, a new vision, a sense of discovery and carefree enjoyment is nuturing to the creative process. Failure to escape, to take the journey, hinders the expansion of the soul. One needs the courage to make the escape, onward to rejuvenation. The path may be unknown, such as the path of creation. Returning from the journey of escape, a new energy, creativity is within your grasp. The creativity that is found on the paper, making shapes, values and color. Responding to one’s thoughts, feelings, being one’s self. Since my last post, I’ve been extremely busy completing commissioned commercial projects, creating and framing new watercolors and alternating staffing duties at our new gallery in Walnut Grove. By ‘our’ I mean award-winning pastel artist Mardie Driftmier and myself. River View Fine Art Gallery is the fitting name, come see for yourself when you are in the area. A ten-day vacation getaway was tossed in the mix, nothing better to clear the mind, restart the creative wheels turning and see the world living around us. But, excuses are useless. And I have been reminded of that recently. My daughter is currently in a photography program in the Seattle, Washington. She is a talented artist who chose the camera as her medium to focus her energies in. As a proud father, I was very happy to hear that part of the program requires a course in New Media. To the advantage of today’s younger students, this is a very rewarding one semester class. Students are required to learn how to build their presence on the internet, the social and business network of today. One way to create that presence is to start their own blog. And, it must be updated once a week. As a reader of my fun little rambles, I ask you to look to the right column, you have to scroll up or down a bit, and check out “Artists I Like” and “Sites I Like”. It’s fun to kick around and see other fine art and other fun blogs. It’s a little bit like getting away for a moment and seeing what else is happening in a different community or rural area as you take that road trip, just to get away. In the meantime, it’s on, or should I say, it’s back on. This blogger is back, and to keep my younger competitors from making me look bad, I’ll be back a lot more. That wonderful state, that place you find yourself when nothing else exists but the mood you find yourself in, not realizing you’re in it, exhilaration, discovery, the feeling you can’t describe, only experience. That wonderful state is addictive. Once felt, when the high passes, the need to experience it again is a most enjoyable yearning. Not every painting needs to be a masterpiece, the thrill, the ride, the journey can not be duplicated, like taking a different back road on another weekend road trip. Currently, I’m working on a collection of pieces for an exhibit in September as the Featured Artist at the Stockton Art League Goodwin Gallery in Stockton, CA. I could write a short novel about the ideas and emotions experienced as the brush danced through the washes and textures of this road trip. The fear of execution eluded me once the paper was wet. These works were for no one, the journey won’t allow it. The anticipation of heralding the exhibit is here. I warned you. The year has become quite productive. I haven’t had the time to reflect on the commercial projects I produced, and I’m still working on. Forcing myself into two careers, I find the time for a journey through the creative highway of fine art, producing several new works, preparing a new collection for after the completion of the September project, and entering a few different shows. 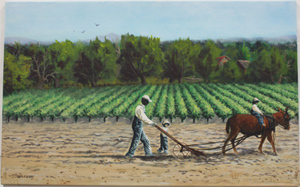 I took home a second place in May at the Lodi Spring Art Show for the 15″ x 22″ watercolor “Percy Lasby Farms”. While leading a team of Walldogs on a mural in Moose Jaw, Saskatchewan, Canada, our hosts treated us to a barbecued rib eye steak dinner inside a u-shaped barn the size of a hanger for an airship. The tractor in the right of the image approaches the lower level storage doors. 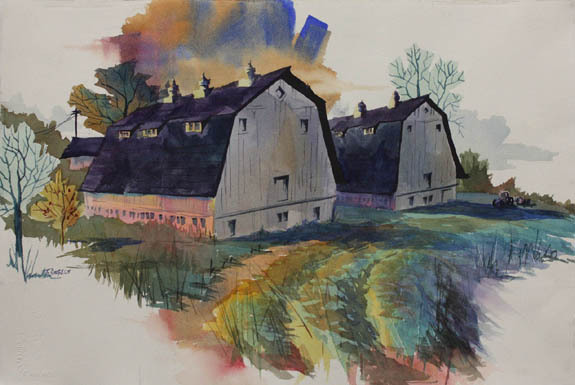 The California State Fair, which opens July 12- 29, 2012, accepted the 15″ x 22″ watercolor “Isleton Lines”, and received an Award of Merit. 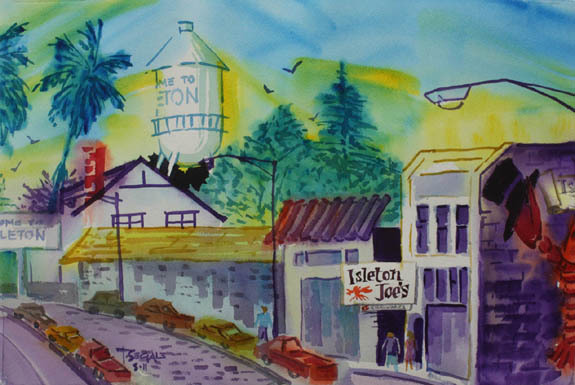 The small Delta town is expressed with colorful washes and lines. 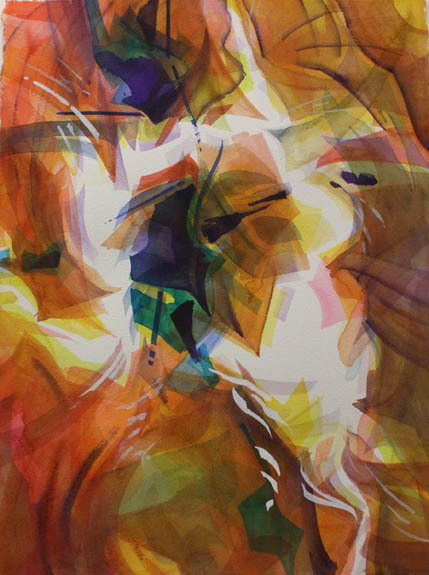 Just yesterday, I received word the 30″ x 22″ abstract watercolor “Calore del Memento” was accepted into the 92nd Annual Open Exhibition of the National Watercolor Society. It would be a lie to say I’m not excited. It’s like finding a special place along the back roads that you will never forget, you may not always get back to, but you hope to, someday. After years of development in the skill of hand lettering, certain projects come along that may seem small but are quite a treat, as well. 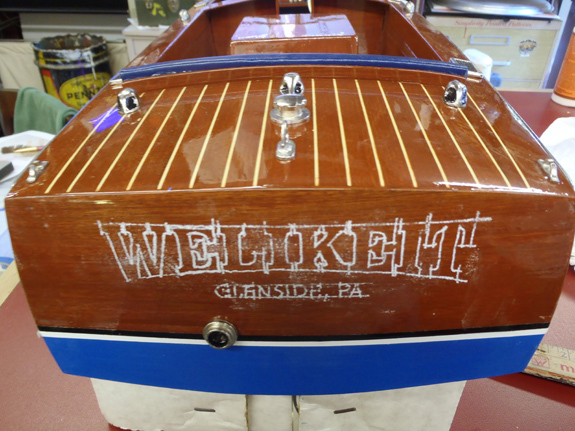 The title of this post might be confusing, because lettering a classic wooden Chris Craft Boat is not a small project. It is an honorable project when the lettering is 23K gold Leaf, outlined in black on a beautifully varnished mahogany wood vessel. Here is a picture of one I gilded in 1999. The picture was taken with the craft floating in Lodi Lake after the lettering was completed. The body of water the boat currently resides in is Lake Tahoe. 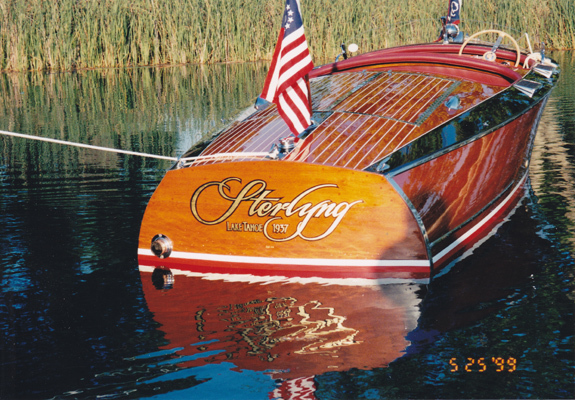 The owner of “Sterlyng”, Bill Norby, has commissioned me to paint many other Chris Craft boats, and these are small. 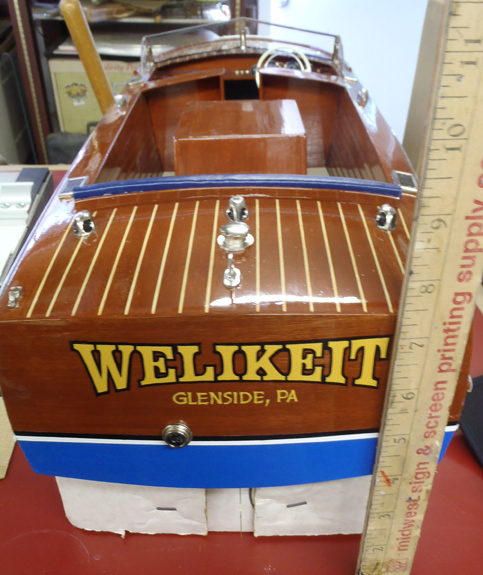 These next few photographs show a ‘step by step’ of the boat WeLikeIt, which I lettered a week ago. The colors are Imitation Gold and a black outline. 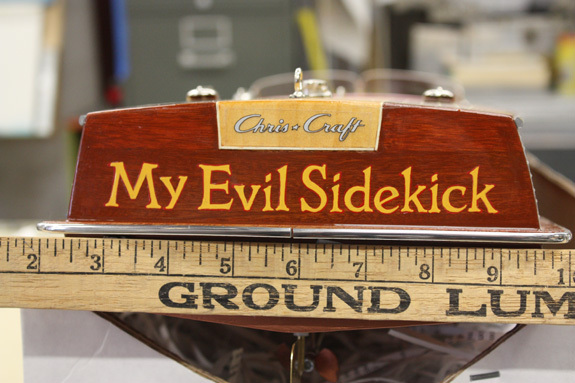 The last picture is the boat My Evil Sidekick , which I lettered prior. 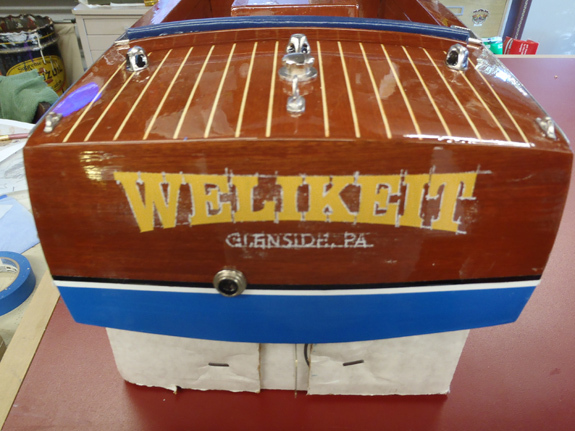 I am known for lettering large on walls and 3″ reverse gold leaf letters behind glass, but not many days are you asked to letter a big proud 3/4″ tall title of a boat with 1/4″ name of its port of call. Am I crazy? Maybe, maybe not. After completing the 12′ x 90′ mural “Japantown Memories”, I was commissioned to paint five 24″ x 30″ x 1.5″ canvas, to tell the story of the Issei in Lodi. This was quite an honor, for a few of the Issei descendants are friends I went to school with, colleagues I worked with or acquaintances I have met in our community. Issei are the Japanese who were born in Japan and emigrated to America. Nisei are the children of Issei, born in the United States. While the Issei were making their own path, circumstances between their homeland and the US grew tense with each decade, until the culmination of war at the bombing of Pearl Harbor. That point in history, was the end of the prosperous lives of many of the Issei. Their homes, land and possessions were taken from them by the government of the country they called home, and the place where their children were born. These five paintings can only communicate this story in the briefest of ways, and they were installed on the wall inside the Issei Room of the Lodi Buddhist Church. The first four I painted are colorful and full of life, adventure and prosperity. The last of the five was intentionally painted with gray and muted tones, barely catching the mood of an unknown future in a desolate place. The majority of Japanese who came to Lodi, CA, were from Hiroshima, Japan. 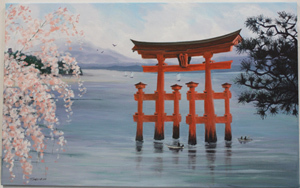 This is a painting of the gate in Miyajima Bay near Hiroshima. The tall structure was made of huge tree timbers, and would be a lasting landmark in the minds of those leaving here. 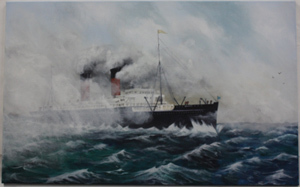 Many of the Issei traveled across the Pacific Ocean aboard a ship, maru, like this one, the Shingo Maru. Here, the vessel is seen breaking through the fog with the Japan coastline in the distance. Picture Brides are waiting for the stamp of approval before entering the United States, inside the Immigration Office located on Angel Island in the San Francisco Bay. The fourth panel is a scene of the prosperous Japanese American family farm. Nisei, children born in America to the Issei are eager to help. Because Issei were forbidden to own land in California, the farm was usually in their Nisei’s name. 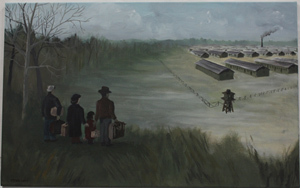 This last painting, in gray and muted tones, is the unknown future before the families as they prepare to enter the Interment Camps, bringing only what they can carry. Japanese families from Lodi were interred in Rowher, Arkansas. To be the first to know when my next post and pictures are added, be sure to enter your email address in the submit window. Are these paintings and gold leaf work of interest to you? Would you like to know when I am showing my work at a gallery nearby? Drop me a note, anytime. Last Wednesday evening, I was invited to give a demonstration at the World of Wonders Science Museum. This was a kick off event, a new type of evening fundraiser for the museum, titled “An Evening into the Unknown, Where Science Meets Art”. Every month, a different demonstration will bring science and art together for the public. 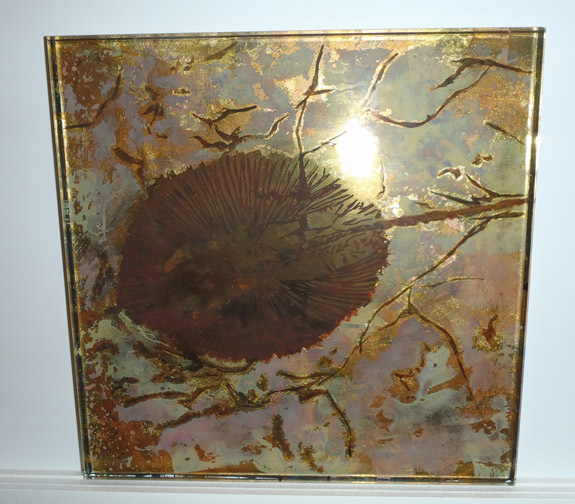 My demonstration was the art of laying gold leaf behind glass in the water gilding method. 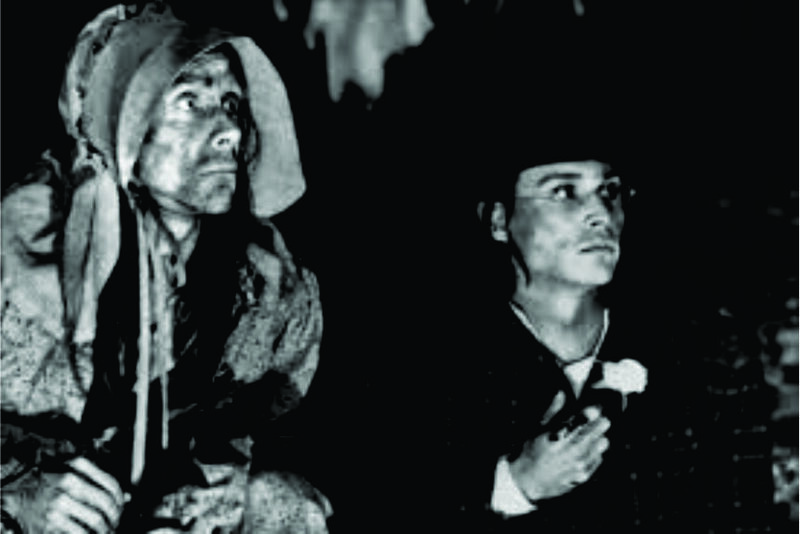 The turnout was good and the audience was dazzled and entertained, many ‘unknown’ to this craft. I showed the proper way to clean and prepare the glass, making the gelatin water size, laying the leaf to the glass on the reverse side, how to burnish the leaf, backing up the leaf with a lettering brush, using a steady hand and a mahl stick, and finally cleaning the excess gold away to reveal the lettering outline preserved. Many glass pieces were displayed, including one for the WOW Science Museum. When this piece is finished with a final backup and framed, I will post it here with a couple step by step pics, also. In advance of the evening’s demonstration, I created three pieces of reverse gilded glass, painted in the verre e’glomise’ technique. Verre e’glomise’ is a French term for reverse glass gilding and painting. Here are pictures of three pieces of glass I gilded and painted in reverse, they will be framed and available through the science museum. 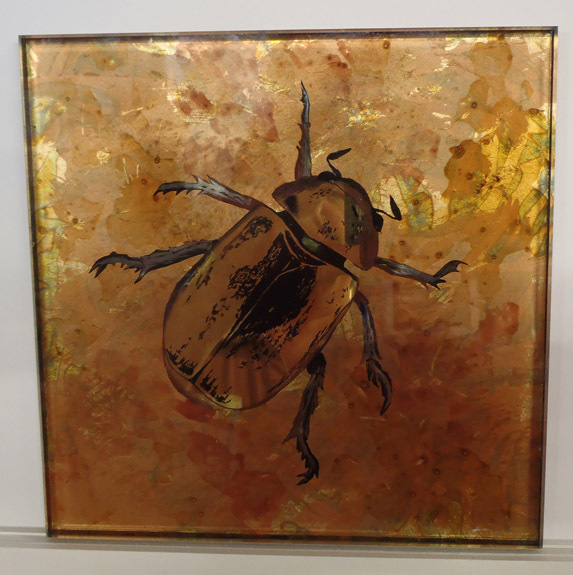 The first is a Golden Scarab Beetle, rendered with 23k Gold Leaf and Palladium leaf,that is etched and backed up with Japan colors. Next, stippled clear and black fibroseal and followed up with bronze mica powders, Then, I painted in colors of gouache and backed the entire glass with green variegated leaf. Next, I gilded this piece with 23K Gold Leaf, and etched a fossil through the leaf, After backing the image with Japan Colors, gouache was applied and mixed in the appearance of stone. Then I gilded the next layer with black variegated leaf. The third piece I created was from an underwater photograph I was able to snap as we were snorkeling in a bay near Kona, Hawaii. The guide called to us within minutes of entering the water, pointing in the direction of a sea turtle that was spotted in the distance. I we swam towards the location, in the distance I could see the peaceful movements of the turtle heading straight towards me. It never changed direction and I was able to get several pictures, this from directly above as it swam beneath me. 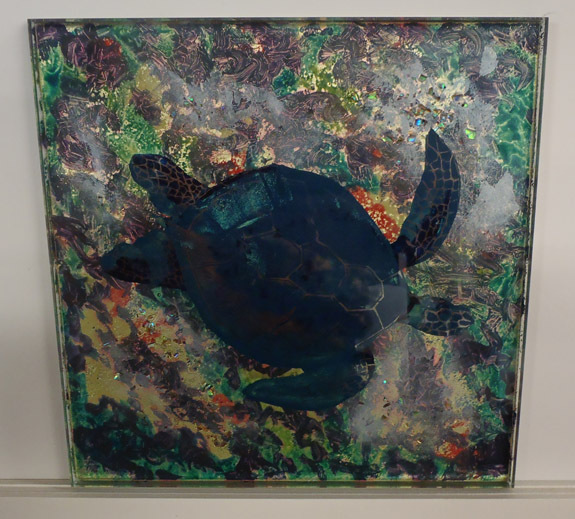 I gild the glass with 23K and Palladium leaf, then etched the turtle, revealing the light and lines of the shell and the sectional areas making its head and legs. Next, I filled in the turtle with three Japan colors, blending as I painted. Next, I applied abalone shell fragments and mica powders, and when dry, painted colors of coral in with gouache. Finally, I backed the entire piece with 18K Gold Leaf, reflecting a warmth through the color. Creating art by reverse gilding and painting of glass is invigorating and leaves me with a thirst to create a new watercolor. Then, I finish a watercolor and crave the brilliance of the gold, a endless circle of fun and discovery. I recently returned from a gathering of fellow dedicated gilders and artisans who share time and techniques by working on a project for the weekend. This annual conclave was started 27 years ago by a friend and mentor of many, Rick Glawson. Rick passed away unexpectedly in 2003, but the gathering has continued in his honor, to encourage the sharing of knowledge and techniques of timeless practices of laying gold leaf, in reverse, in glass. 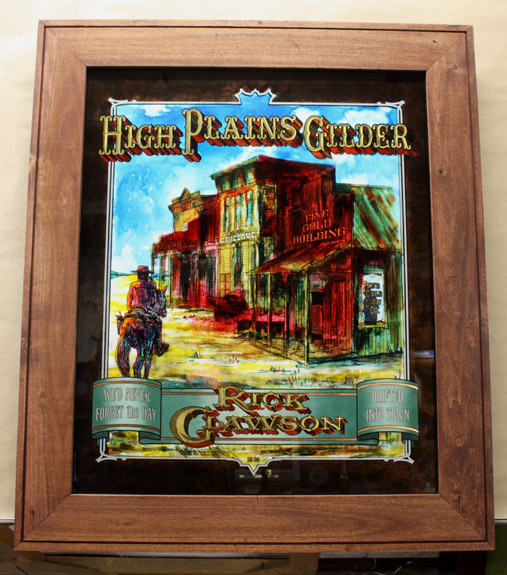 This glass piece was designed for last years gathering, by a good friend, Larry White, and titled ‘High Plains Gilder”. The glass is 29″ x 24″ x 1/4″ and has a 4″ wide stained poplar wood frame. 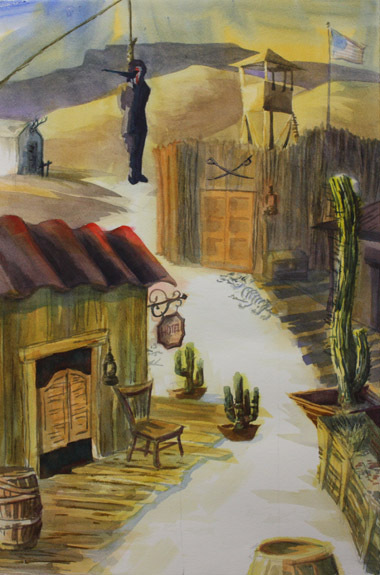 Larry’s design immediately conjured up visions of a western novel, I had to attempt a simulated watercolor effect for a cover of the fictitious paperback novel. After laying 23k gold leaf in the traditional water gilding method, I distressed the remaining gold in the dirt street-scape. Next, I slapped transparent screen inks on the glass like banging color onto a sheet watercolor paper. Most of the traditional gilders in the room were quite apprehensive to my style, thinking I may ruin the picture. One thing the gathering does insure is not every artisan’s project turns out the same, all are beautiful pieces and reflections of each Gilder. 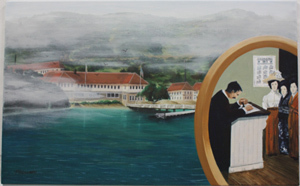 The success of this technique became very apparent once the finished painting was framed with a sheet of watercolor paper mounted behind the glass. This year’s project is not yet framed, I will add this when it is completed. I have been asked to design next years Gilder’s project, I hope to create a design that will encourage others to attempt to break from the ordinary. Art can be expressed in so many ways, but what is each artist’s individual expression is what matters the most, especially if it strikes a different chord in every viewer. Here I had the opportunity to create a gift for a good friend, inspired by his enthusiasm for building and a mutual enjoyment of fine western movies. Seven different movie set pieces are featured in this painting, seems they all have something inside, something to do with death. “Happens to everyone sooner or later” is a line from another film that comes to mind. I sat in his yard quickly sketching several different vantage points, and then sketching again, all the pieces together. Then, I created a couple of value sketches to find my composition, where I wanted to go. Once I decided on the direction, I began to paint, now only choosing the colors I wanted to use. Painting in this style is free and loose, painting how I feel as I lay the color down in the strokes I choose. This is a watercolor painted on Lanaquarelle 140lb cold press paper. Feel very free to let me know how this piece makes you feel. Here is an antique restoration project I just finished. 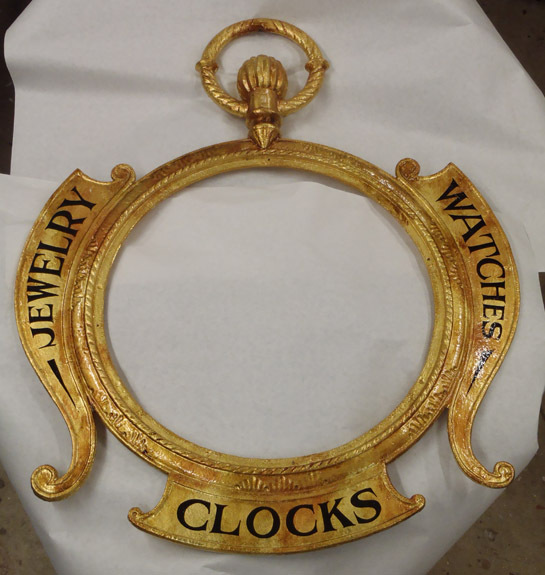 This is a 36″ x 30″ double face cast iron pocket watch sign, at least 100 years old. This was stripped, primed, painted and gilded with 23K gold leaf. The gold was then aged with a patina and sealed with a clear finish. The watch faces were hand painted roman numerals and circular striping with lines for each minute and triangle pointers at each five-minute mark. 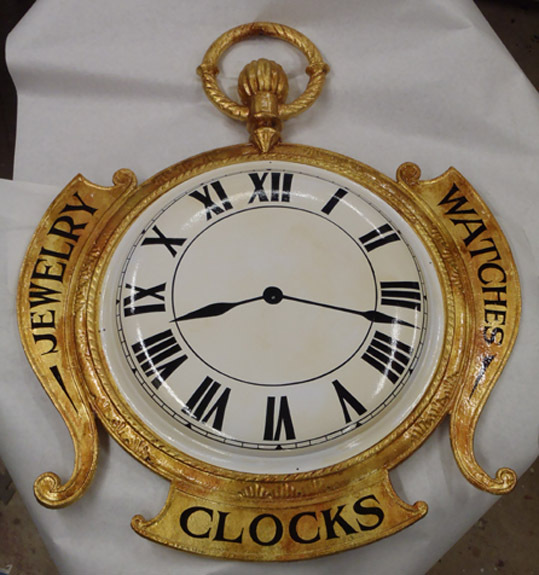 A clock makers traditional roman numeral 4 is four vertical “I” s, no addition of the “V” until you reach number 5. The sign is quite heavy. Two additional photos showing the three pieces of the watch. Gold leaf restoration work has a historical enjoyment to it. There is always that piece of the past that is interesting to learn, and I like to visualize the interior of the craftsman’s studio when a piece like this was fabricated.